Revive your memories of summers spent in the southern Italian seaside where the lanes are lined with cactus trees bearing bright red prickly pears with the Sweety mocktail. Fresh passion fruit, lime and Sanpellegrino Ficodindia e Arancia come together in this signature mocktail that will make you start revising your holiday bucket list. 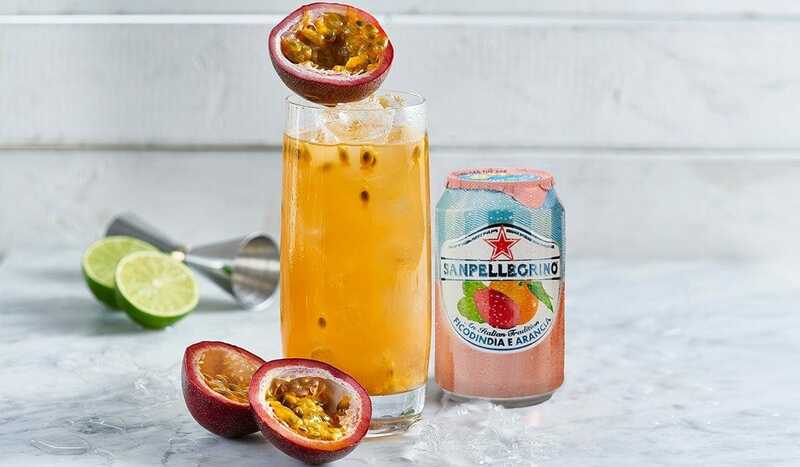 The flavor of exotic prickly pear of Sanpellegrino Ficodindia e Arancia gets a tropical hit with passion fruit and lime and the result is dazzling. Light and pretty as much as it is tasty, Sweety embodies those moments of leisure when summertime helps you take yourselves less seriously, to appreciate the good things in life. Plate up some friselle, hand out some arancini, and get into the right mood at your next get-together with Sweety. In the bottom of a sturdy, large glass (14 oz capacity), pour the lime juice, then add the passion fruit and honey. Combine well by stirring gently with a bar spoon, and fill the glass with ice. Top up with Sanpellegrino Ficodindia e Arancia. Garnish with ½ of a passion fruit. If you are 21 years old or over you can turn the Sweety into an alcoholic drink by adding 1 oz of white rum.